Find out what's new in the Skrilla platform! Free to play Contests going Global! At the moment we are running free to enter daily fantasy contests into Australia, USA and Canada for cash or token prize pools. The beta plates are off! Within two weeks we will be opening up free-to-play tokenised Contests into a significant number of countries, removing the barrier to existing eager to play users, and driving adoption and usage of the token with a much broader esports community. We are are currently building out a marketplace, to be able to purchase fresh gaming gear from our site, as just one option to utilise the SKR you earn! Keep an eye on this space and start accumulating your SKR in preparation! We are finalising the steps necessary to run Pay to Play contests in approximately 20 US states, complementing the 50 states we already offer Free to Play Contests. This US Pay to Play launch will coincide with the expanded functionality of the SKR wallet. 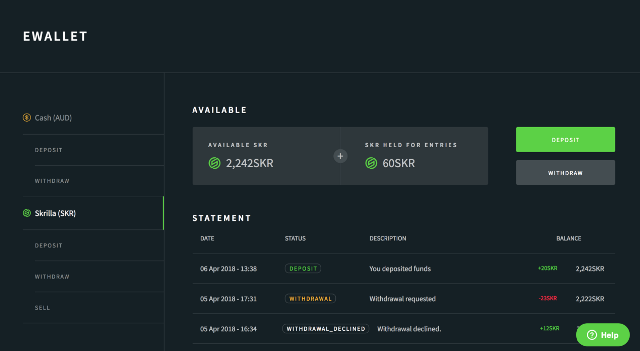 We have spent March building out additional functionality to the SKR wallet. This has been a big piece of work and we are happy to report we are close to completion. When finalised, Pay to Play users will have the ability to purchase SKR using multiple payment options, and sell it for ETH or BTC all within the platform. *SKR purchases will be used to buy back SKR on the market to help drive liquidity of the token on external exchanges. We are excited to get this up and running as this will remove the remaining user experience friction, supporting our focus on rapid token integration, token utility, and community adoption.